The plant kingdom is made up of multicellular, photosynthetic eukaryotes. 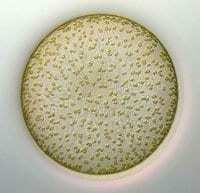 These multicellular organisms contain specialized cells that perform different tasks. Marine algae (seaweeds and phytoplankton) are a loose group of some of the simplest organisms that contain chlorophyll (like plants) but include members of both the Empires Prokaryota(Kingdom Bacteria – e.g., cyanobacteria) and Eukaryota (Kingdoms Chromista, Plantae and Protozoa…). Marine algae though are abundant throughout the ocean and can either float freely or cling to substrate such as rocks and reefs. The majority of seaweeds are classified as red algae (~6,000 species). There are also brown algae (~2,000 species) and green algae (~8,000 species). None of the algae species are known to be poisonous, and many species are harvested for human consumption. Phytoplankton are microalgae that form an essential component of the marine food chain. These single-celled plants provide nourishment to many marine species and they also play an important role in regulating the amount of carbon in the atmosphere. There are two main types of the larger phytoplankton species: Diatoms and Dinoflagellates. Smaller phytoplankton categorized as nanoplankton and picoplankton. As mentioned earlier, algae are photosynthetic eukaryotes that are either unicellular, colonial, or multicellular. Algae with at least some multicellular members are grouped into two main Empires or Domains (Prokaryota and Eukaryota) and then further down into multiple Kingdoms (e.g., Plantae), Supergroups, Divisions, etc. mainly in the Eukaryota Domain: Phylum Rhodophyta (red algae), Class Phaeophycea (brown algae) and Phyla Chlorophyta and Charophyta (green algae). Red and brown algae species are most commonly marine; green algae are found in abundance in both marine and freshwater. 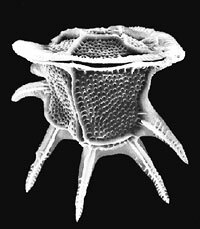 See Algaebase (130,454+ species and infraspecific names) for the latest species and more information. Red algae grow as single-celled plants or plants that grow as filaments, branched plants, broad flat plates, and ruffled plants. They come in a variety of sizes, but most red algae are small. All species attach to substrate such as rock or coral and sometimes to an animal shell or even another algae species. Brown algae contain the largest and most complex algae plants. Pacific kelp are a brown algae species. There are no unicellular or colonial forms of brown algae. Brown algae stores food reserves as a substance called laminarin, similar to a lesser known species of gold algae in the Class Chrysophyceae. Brown and gold algae also have in common the presence of flagellated cells of both sperm and motile spores. Brown algae are commonly found attached to the substrate in cool, shallow waters near the shore in temperate and subpolar regions. Some forms of brown algae have developed adaptations to survive life on the coast where they may be pounded by surf or submerged then exposed with the tide. Large brown algae are used as shelter for some bottom-dwelling animals. They also provide serve as substrate for other algae that grow as epiphytes, or plants that grow on other plants. The Chlorophyta and Charophyta (green algae) are the most biodiverse of the algaes with species that grow in a variety of forms and in a variety of habitats (the Charophyta are found entirely in freshwater for example). They are typically small and simple, with many single-celled species, some that form branched filaments, hollow balls of cells, or broad, flat sheets. Some species attach to sandy shores by secreting a calcareous cement rather than holdfasts that might shift with the sand and become unstable. Seagrasses, unlike seaweed, are flowering marine plants that live submerged in the marine environment. There are an estimated 50 species of seagrasses worldwide, most of which are found in the tropics. Seagrass beds grow in shallow waters forming thick beds that provide an important habitat for marine life in temperate and tropical seas. These habitats vary in size and abundance from isolated patches to a continuous area that grows for miles. In waters with a lot of wave activity, beds tend to be patchy. In calmer waters, seagrass beds tend to carpet the seafloor. Seagrasses typically grow as long, thin leaves with air channels that grow up from a creeping rhizome. Seagrasses are found from the mid-intertidal region to depths of 50 m. Most species grow in soft substrates, such as sand, and form a dense mat of entwined rhizomes and roots that not only secure the plant, but also stabilize sediment. They also absorb wave motion and slow currents. As mentioned previously, Pacific kelp is a large species of brown algae. Kelps grow throughout the cold temperate regions of the world. 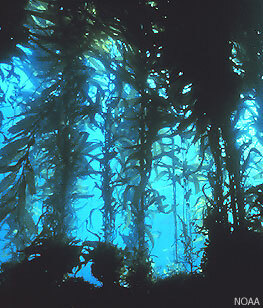 They are known as kelp beds where there is no surface canopy and kelp forests where they form a canopy. Like other algae species, kelps attach to the substrate using a holdfast. The holdfast extends into a stem or trunk ending in broad, flat blades. A gas-filled pneumatocyst is found beneath the blade, which floats the kelp at the surface. They take up nutrients generated by the constantly moving seawater. Macrocystis and Nereocystis are the two genera that make up most kelp forests on the Pacific coast of North America. These enormous kelps grow upward through the water column to 20-30 m in length. These plants grow toward the surface where they can spread their blades to obtain sunlight, which often blocks sunlight from other organisms. Beneath the canopy, an “understory” of algae is found, which forms another layer. Kelps grow extremely quickly under the right conditions. Growth rates of 6 cm/day have been recorded in Nereocystis luetkanan (Scagel 1947) and Macrocystis pyrifera has been recorded at 50 cm/day (North 1971) on the California coast. Surprisingly, despite this rapid growth rate and high rate of productivity, relatively few marine species graze directly on the kelp.